The harbour area in Barcelona is lovely. This is a city which has truly made the most of it’s location on the coast. In the traditional port area there is a huge walkway which crossses the harbour to the large Maremagnum shopping centre. On one side of the walkway there are hundreds of sailing boats moored and on the other side, the larger ships can be seen. There’s a long harbour promenade to walk along and as you do, you will find the Olympic Port which was used in the 1992 Olympic Games for the sailing activities but is now a thriving area with restaurants and bars. 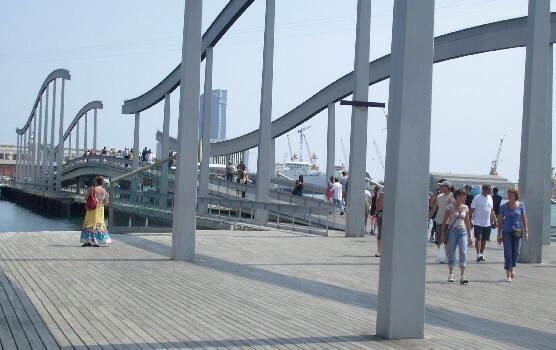 When arriving from La Rambla, the first building you see is the beautiful “Port de Barcelona” building at the water’s edge. You can then proceed over the walkway to the shopping centre, or along the harbour wall. Inside the shopping centre there are restaurants and bars as well as shops and access to the IMAX cinema. There is an official Barcelona FC shop just inside the mirrored entrace to the shopping centre. To get to the Olympic Port area, you will need to walk along the harbour edge. The Harbour is at the bottom of La Rambla (Las Ramblas). The harbour is a public area and is open 24 hours a day, but the Maremagnum shopping centre is open from 10am to 10pm, restaurants until 1am and bars until 4.30am.